The TB Series trunnion ball valve family provides positive shut-off and directional flow control for systems with working pressures up to 10,000 psig (689 bar) and temperatures from -40 to 450°F (-40 to 234°C). Tube Fittings Sizes 1/4 to 1/2 in. (6 to 12 mm) 1/4 to 1/2 in. (6 to 12 mm) 1/4 to 1/2 in. Pipe Sizes 1/8, 1/4 and 1/2 in. 1/8 and 1/4 in. 1/8, 1/4 and 1/2 in. 1/8 and 1/4 in. Options for TB Series ball valves are listed below. For more information please see the TB Series Trunnion Ball Valves catalog. 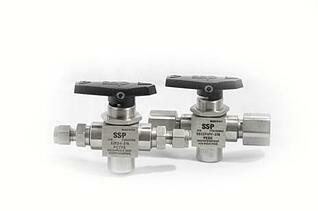 TB series ball valves are suitable for a wide variety of control and instrumentation applications. The trunnion ball and spring loaded seats enable them to perform in systems having dynamic pressure, flow, and temperature requirements. TB series valves are used in high-cycle low-temperature applications such as CNG fueling, and as isolation and switching valves in valve control panels and test stands. Their compact size makes them a good choice for panels and other applications where space is limited. End screw construction allows a wide variety of end connection size and type combinations. Spring load seat allows full pressure at any port making them an ideal choice for both switching and selecting valves. The SSP catalog contains only the most popular configurations. TB Series ball valves are highly configurable. Use the table below to configure valves for your specific applications. For further assistance please use the product information form or contact SSP Customer Service.